This week, we will be featuring a few healthy seafood dishes that you won't want to miss out on. Panko crusted swordfish and steamed mussels have always been favorites of mine, every time they're added to our already vast seafood selection. Our first dish is a wild-caught swordfish filet. Over the course of the last few decades, farm-raised seafood has become more common in food supply. Wild-caught seafood (of course more expensive due to the extra cost and labor of fishing it) is almost considered a delicacy. The grape seed oil used in preparing our swordfish has health benefits of its own. Studies show that it aids in anti-inflammatory, anti-oxidant, anti-histamine, anti-aging, anti-allergic, antimicrobial and adaptogenic activity. The next dish we're introducing is another seafood favorite. We take a full pound of fresh mussels and steam them in this aromatic and flavorful broth. We serve this over a bowl of black linguini. The presentation alone is quite interesting. The black comes in during the process of making the pasta. 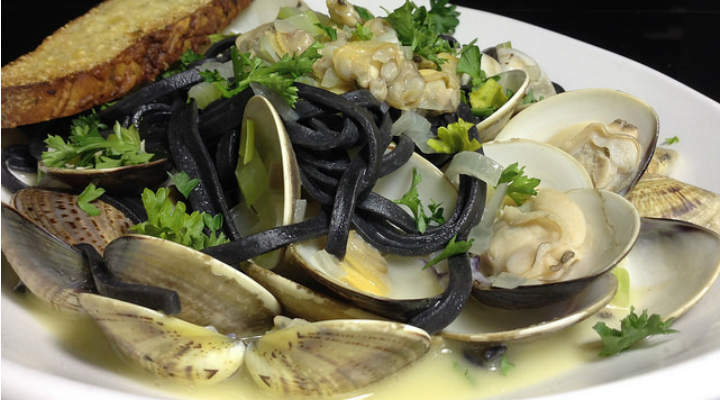 Squid ink is added to create a silky, yet deep black hue providing hints of the salty ocean. Come and give these healthy, flavorful dishes a try this week. Make your meal complete with a glass of chardonnay... it pairs quite well with the mildly sweet flavor of either dish. Plus, a glass of wine a day is just what the doctor ordered!